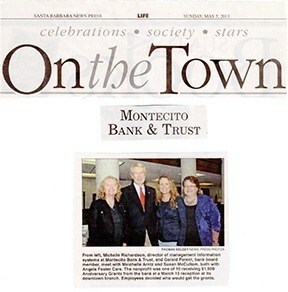 From left, Michelle Richardson, director of management information systems at Montecito Bank & Trust, and Gerald Parent, bank board member, meet with Meichelle Arntz and Susan McCollum, both with Angels Foster Care. The nonprofit was one of 10 receiving $1500 Anniversary Grants from the bank at a March 13 reception at its downtown branch. Employees decided who would get the grants.